There is plenty to like about this book. There are many creative stitches and it’s great that most of them are shown with variations, including reversed direction, vertical and horizontal versions, and with different fillings. I also liked her stories about the stitches, telling us where they came from and how she used them. Unhappily the many faults in production mar this book from beginning to end. Ultimately it’s a hot mess. That’s a shame because with a bit of attention to detail and professionalism in creation, we’d have a book that was a classic and very useful. The author has written enough books by now that there should be some improvement here, but there is not. Let’s start with the graphs. I realize that Baird has been teaching and writing stitch guides for decades and that the book takes stitch diagrams from many different years. But this does no favors to the reader. You’ll find diagrams with no grid, diagrams with grids so light as to almost disappear, and grids where the symbols are so similar the reader cannot use them to make the stitch. If a stitch has an explanation sometimes it is printed in a font that is hard to read and so unevenly reproduced that parts of letters fade out, making it even worse. I realize that technology and our ability to diagram stitches changes. But aren’t the diagrams supposed to teach us something? How can they if they cannot be read? When I got the book I was excited to try several of the stitches. I selected one that looked interesting and that was new to me. I could not make the stitch, the diagram was too unclear. 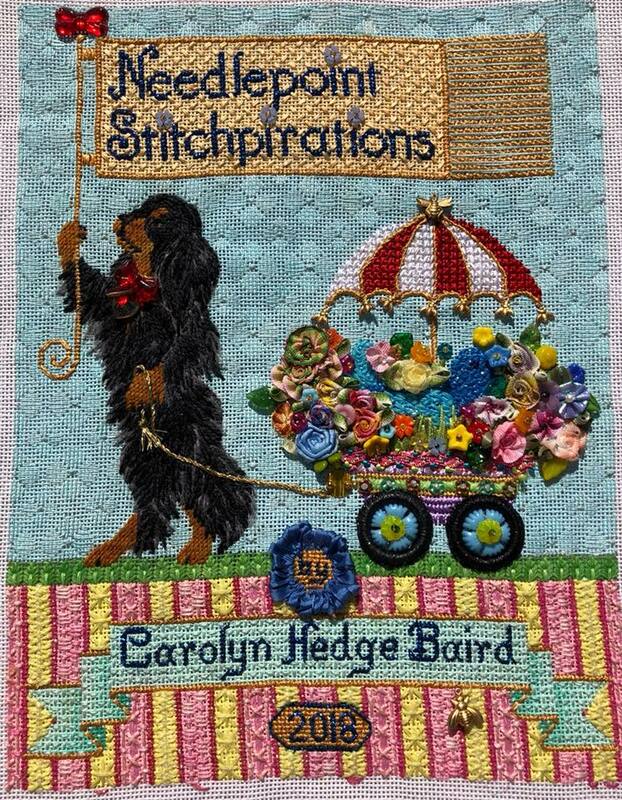 I showed this book and another stitch diagram from a different author to a non-stitcher. He could understand the clearer stitch, but not the one in this book. The diagram problem strikes at the purpose of the book. The next biggest fault is the multitude of font styles and the tons of clip art that create visual noise on virtually every page. I know Baird is not a graphic designer and I know that different fonts can be very alluring (that’s why I own hundreds of them). But ultimately the purpose of the book is to convey knowledge, information, and instruction. If every stitch uses a different font, many of them hard-to-read for text, our brains and eyes get tired quickly and will overlook stitches and ideas that could inspire us. It is so difficult for me to read a book created like this, that at least four times I looked through about a third before giving up because my head hurt. She does use a consistent font for her chapter opening pages and for the many “What inspires you?” pages throughout the book. Unhappily there is no attempt to differentiate headings from text, sometimes not even by size. Printer’s ornaments and clip art combined with a sameness in font and one that is somewhat hard to read, make even these pages feel cluttered. The other problems are cosmetic but add to the amateur, hastily put together look of the book. For page numbers under 100, the numbers are placed on the page crooked. For numbers over 100, the first digit of the number was written in by hand and reproduced by the printer. Sometimes the clip art has obvious cut lines around it, sometimes not. And the clip art is just there to fill up space. It has no connection to the stitch and no connection to the art on nearby pages. It’s a crying shame because there are treasures here. But unhappily it looks like a scatter-brained effort by an amateur that was produced with tools antiquated in 1995. We deserve better from such an outstanding teacher and stitcher.